304 pages | 4 B/W Illus. Acknowledgements. Permissions Acknowledgements. List of Figures. Foreword by Steve Biddulph Introduction to the Second Edition. 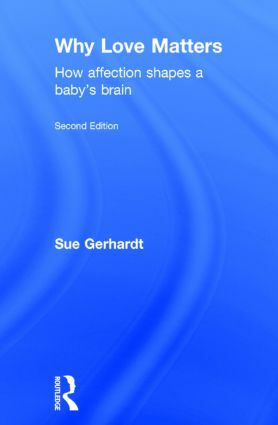 Part One - The Foundations: Babies and their brains 1. Before we meet them 2. Back to the beginning 3. Building a brain 4. Corrosive Cortisol. Conclusion to Part 1. Part 2 – Shaky Foundations and their Consequences 5. Trying Not to Feel 6. Melancholy Baby 7. Active Harm 8. Torment 9. Original Sin. Part 3 – Too Much Information, Not Enough Solutions 10. ‘If all else fails, hug your teddy bear’ 11. Birth of the Future. Bibliography. Index. Dr Sue Gerhardt has been a psychoanalytic psychotherapist in private practice since 1997. She co-founded the Oxford Parent Infant Project (OXPIP), a pioneering charity that today provides psychotherapeutic help to hundreds of parents and babies in Oxfordshire and is now the prototype of many new ‘PIPs’ around the country. She is also the author of The Selfish Society (2012).